With persistence, vision, courage and dogged perseverance, South Africa's only remaining autonomous mission hospital, Durban's McCord, had this May weathered 100 stormy years, forging a global reputation for training and affordable health care. Now its caretakers are planning for the next century, jealously guarding its hard-won ethic of selfless patient care against any social mores or political expediency and scanning the time horizon for projected needs, harnessing its legion of grateful beneficiaries. McCord celebrated its centenary over 3 memorable days at the beginning of May and continues to punch way above its 144-bed fighting weight through its egalitarian values, excellent senior training leadership and integrated management systems. Perhaps best known for its founders' perseverance and creative pragmatism in the face of a once antagonistic medical profession, fierce political resistance and social exclusion, McCord paved the way for black medical education in South Africa. 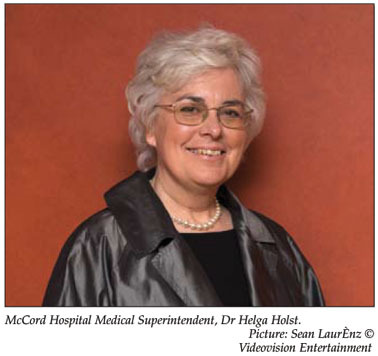 Its Canadian-born medical superintendent, Helga Holst, who once did a short obstetric stint at McCord in 1978 before 'losing my heart to Africa', ended up in her current job 17 years ago. She describes the hospital's target market as the 'employed uninsured'. Translated, this means the hospital remains faithful to founders Dr James B and Margaret McCord's 1899 vision: 'to open the medical department for the Zulu Branch of the American Board of Commissioners for Foreign Missions' (ABM later became the Congregational Church). Not only did the McCords and their successors face implacable opposition to a hospital for black patients in Durban's leafy Berea from 1909 (it was then cleverly called the Mission Nursing Home), they were repeatedly threatened with closure under the Group Areas Act. Already successful in training the first class of 4 black female nurses, Dr Alan Taylor, Holst's 1922 predecessor, joined forces with Dr McCord in the first abortive attempt to establish shorter private medical training for Zulu men. Holst wryly observes that 'things have come full circle', with family medicine and rural health expert, Professor Jannie Hugo, and others now developing a cadre of mid-level health workers. Taylor and McCord were however thwarted by the white-dominated South African medical profession and it was only in 1945, when Dr J L Njongwe became McCord's first resident medical officer, that Taylor established a Natal-based lobby group called the 'medical school committee'. Public meetings and deputations to government lobbied to ensure that Durban would not be overlooked as a centre for medical training for 'non-Europeans' when the issue came up for debate at national level. Their labours finally yielded fruit in 1957 when the first class of students graduated from the Durban Medical School and entered clinical training at McCord  prompting more Group Areas Act threats. Holst says McCord and Taylor's belief that 'people of African descent' had the ability, desire and need to be trained to provide health services for their own people flew in the face of prevailing beliefs that 'blacks' simply did not have such ability. The nurses sat the national exams and excelled, although their qualifications were not officially recognised. McCord's current nursing home then provided the premises for a cadre of black medical trainees in the early 1940s  whom the establishment failed to accept. Taylor later became the first dean of the (now Nelson Mandela) Medical School while serving as medical superintendent of McCord Hospital. Holst told Izindaba that she, her staff and supporters viewed the centenary celebrations as putting 'a stake in the ground'. They are currently implementing an electronic patient record system across the entire hospital (it has been in existence in the HIV/AIDS programme for the past 4 years). Linked to this is an upgrade of the hospital's systems, policies and procedures, the human resources and quality-assurance systems, and a staff development programme. McCord won the Discovery Foundation's Service Excellence award last year (R1 million) in recognition of its contribution to health care nationally. Holst said a priority was to develop a more affordable health care model for the uninsured employed patient market, given the economic downturn and insufficient government funding for the 31 interns they train annually. Having to carry the cost for 11 additional interns meant taking money away from their patient care budget, which forces the hospital to increase patient payment contributions. Ongoing lobbying has resulted in 'a sympathetic ear' from the national health department, but there has been no move to get the 31 interns onto the government PERSAL system. 'We're essentially training at the cost of funds for patient care, with our operational subsidy being reduced in real terms over time,' Holst said. Being a private, subsidised, not-for-profit mission hospital meant that patients' fees were set at a proportion of the total cost of their care. McCord has three sources of income: a health department subsidy, patient-generated income, and PEPFAR (President's Emergency Plan for AIDS Relief), which pays for half of the HIV- related work. The health department meets the ART- and laboratory-related HIV costs while PEPFAR covers HIV-related salaries, and administrative and structural support. One of Holst's biggest worries is that hospital fees have now reached the point where patients are struggling to afford the subsidised rates. By fully covering the cost of intern training the government would be affirming McCord's excellent training and taking advantage of the strong public service ethic instilled during their rotations. Holst said many community service doctors who had been through McCord ended up staying for a year or two longer at their conscription posting sites, something the country badly needed. McCord does not take comserve doctors on principle, believing them to be more sorely needed elsewhere. Asked what it was at McCord that engendered such strong service values, Holst put it down to good infrastructure, leadership and management systems, the stability and leadership provided by a committed core of competent senior doctors and nurses, and the 'very strong emphasis' on caring, firstly for patients and secondly for colleagues. At the heart of the hospital remains its service-orientated Christian ethos, not the 'me-first' culture so prevalent globally. Given the opportunity and ability, McCord strives to prepare and develop programmes and services in advance of projected needs, an example being the HIV services that began 12 years ago, initially to meet the social rather than the medical need. When ARVs arrived (McCord was 5 years ahead of the government ARV roll-out), poverty, hunger, funeral and social support infrastructure were already largely in place. A similar dynamic existed with internship and nurse training, with 3 of McCord's nurse training courses now the Nursing Council national standard. Widely held as the most popular intern training site nationally, McCord is small and flexible, with a minimum of bureaucracy, allowing for great adaptability. It also has a 42-bed, intermediate step-down facility for patients with opportunistic infections and where ART prepping is done some 2 kilometres away. The average length of stay for these 'step-down' patients is now 12 days. About 90% of patients admitted to the step-down facility in stretchers and wheelchairs improve rapidly and are discharged walking and motivated to continue their treatment programmes. Holst puts this down to holistic care that caters for their psycho-social, spiritual and medical needs; 'drugs alone don't do it,' she emphasises. If McCord's vision for the next century succeeds, then a stronger focus on comprehensive, integrated ambulatory care services will help further reduce the cost of hospital care at all levels, not just for HIV-related illnesses. The 3-day centenary celebrations included a mayoral reception at the Durban Art Gallery, a presentation of 'Past, present and future' in the Durban City Hall, tours through the hospital by McCord's 32 specially trained 'ambassadors' (trained by Durban Tourism and local historians), and a gala dinner for the 'golden oldies' from all over the world, and concluded with a thanksgiving service led by the Rev Michael Cassidy on Sunday 3 May. 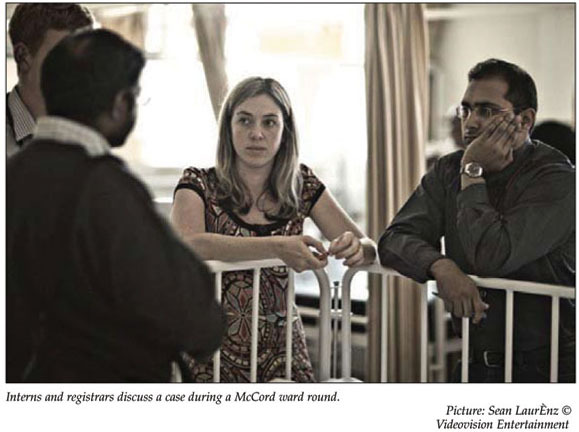 McCord's trainees include some of the country's leading health practitioners and politicians. These events will be documented by celebrated local film maker, Anant Singh. Holst said the new metaphor for McCord Hospital is that of a lighthouse that had been 'battered by storms and is in the process of restoration in the midst of further storms, shining a far brighter light that requires far less energy, into Africa'.